You are currently browsing the tag archive for the ‘growing pains’ tag. Saturday mornings, here’s where I worship. I keep the volume low and move 10 inches from the screen so that I can hear what’s happening on The Mighty Orbots. My parents have warned me not to sit so close, that I’ll ruin my eyesight, but if I’m very quiet and don’t wake them, who’s to know? I realize that The Mighty Orbots are a variation of the “robots-that-are-something-else” genre, that most other kids at school prefer Transformers, and that I have thrown in my lot with the more numerous (and more affordable) Gobots, but there is so much to want, and if I can get closer to the screen, maybe I can have them all. Perched on the corner of my mother’s waterbed, I watched what my mother wanted to watch. This mostly involved Dynasty, which we picked up right during the Moldavian Massacre. With each subsequent season finale (hotel fire! Alexis driving off a bridge! Krystle missing! ), my mother and I scoured issues of Star and the National Enquirer to figure out who survived and who didn’t. We even tuned into The Colbys, the spin-off, right to the bitter end when Fallon was abducted by aliens. At 10, we watched the nightly news, followed by re-runs of M*A*S*H* at 10:35. Sometimes I stayed up the extra half-hour for Nightline, but usually by that time, my mother was already asleep. My father, because of his snorning, had been banished to the basement years before, and, there, he erected his home theater. He bought a huge set for the time, speakers trailing silvery wires, and two VCRs for direct tape-to-tape duplication. Everywhere we went offered rentals: strip-mall storefronts; Blockbuster Videos; a Vietnamese shop specializing in Chinese serial melodramas. Even our local King Soopers had a small cordoned-off section of videotapes. My father laminated his membership cards, and once a week, he’d flip through them, deciding which to visit that evening. “It’s best to see movies big,” he said, proud of his set-up. True; but at the time all I wanted to see was The Mutilator. One character in Good Morning mentions how small talk is a social lubricant, how it keeps the wheels of society turning smoothly. This may be true amongst strangers and neighbors, but what about with your spouse, to whom you may feel as though you’ve said everything? Since their retirement, my mother monopolizes the phone line in her room, chatting with friends, and my father retreats to the basement where he mans a DVD duplication service for his friends. But, in the afternoon, they convene before the small TV on the dining table to watch various afternoon judge shows, Wheel of Fortune during dinner, and Dancing with the Stars in the evening. They debate the merits of so-and-so’s pasodoble. They discuss whose judicial sensibilities the most admire (Judge Judy, yes; Judge Greg Brown, no). And when they eat, instead of silence, they test their knowledge of American idioms, shouting out answers, trying to solve the puzzle before Vanna turns over the next letter. 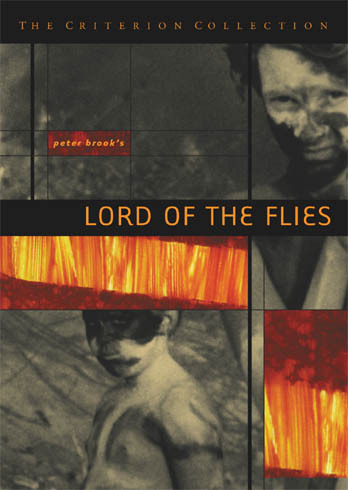 Reading Lord of the Flies is a high school rite of passage, one of those time-honored traumas which includes: first shower in the locker room, first kiss, first erection in public (though usually not concurrent). 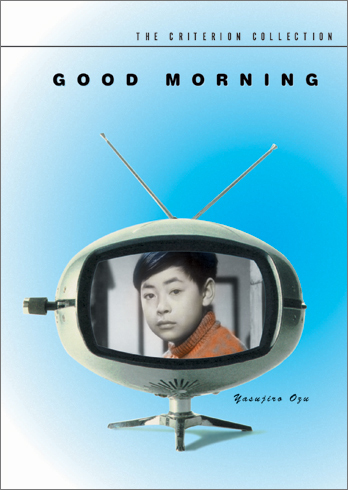 I, only somewhat interested in the novel, read anticipating only the inevitable test. What’s the symbolism of the downed airman? Pig head on a stick: as yummy as it sounds? Do you identify with organizer Ralph or hunter Jack? The themes of savagery and tribalism escaped me, but I didn’t have to look far into my own history for proof of their existence. From sixth to eighth grade, I had a cabal: John W., a Chinese-American with whom I competed academically; Jason B., biracial and hyperactive with a head of curly hair; and Bill H., whom I may have had a crush on. We lunched in the North Middle School cafeteria and laughed the loud, raucous laughter that hides the insecurities and fears of adolescence. We weren’t close enough to hang out outside of school, but close enough to associate with one another, to taunt more unfortunate middle-schoolers, close enough to call each friend. That tribe was disrupted by high school: John went on to Central, while the rest of us continued to Hinkley. I could have formed new alliances and met new friends, but I tried to cling to the old ways. We remaining three were still friendly, but it wasn’t the same. If we were stranded on a desert island, I’d certainly receive a share of roasted pig but probably wouldn’t be the first one served. The irrevocable schism came when Josh D. transferred to Hinkley from California with surfer charm and aw-shucks tan. Bill and he bonded, an easy camaraderie that made me nostalgic for a friendship that had never existed. They shared jokes to which I wasn’t privy. They were hunters, while I was still tending to the little ones. So I had one last joke for Bill. One day, I was in the orchestra room while Bill was practicing his cello. As he went to sit, I pulled the chair out from under him, and he fell backwards, clattering as he absorbed the brunt to protect his cello. I stood for a split-second, trying to gauge if this was funny, and the orchestra teacher told me to leave. A few minutes later, she called me back. Bill wasn’t in the room. Bill could have gotten seriously hurt, she said. What was I thinking? she asked. To answer, I could have shown her the scene from Lord of the Flies in which the savage boys dance around a bonfire, frenzied, and end up spearing poor Simon to death. It was The Beast, I could have said. I avoided Bill for the rest of the year, and he transferred at the end of it. By graduation, Josh and I had become friends. I lent him my cherished copy of Saint Etienne’s Foxbase Alpha senior year. The next year, Saint Etienne released So Tough, which samples two lines from Lord of the Flies (“Maybe he means it’s some sort of ghost.” “Maybe that’s what the beast is. A ghost.”) But by that time, I was off at college, and my previous associations and tribes had dissipated, like smoke. Josh never returned my CD. · horror movies. This falls under the ‘guilty pleasure’ category if I felt any guilt about it. Any Manichean struggle is incomplete unless it involves decapitation via machete, high-pitched screams, zombies, or fingernail-related trauma. · cats. Please play with me. Please feed me. Please let me outside. Please rub my belly. Please lie down next to me on this bed that I have thoughtfully make comfortable by pre-kneading the cushions for you. · student papers. It will make many more lifetimes than I have to teach everyone that therefore and however are not Superglue conjunctions to hold sentences together. · talking about films. After watching a film, I spend at least four hours thinking deep thoughts. During that process, I draw fascinating parallels, make startling observations, ponder earth-shattering existential questions — but still end up writing about cats. · refinery burn-off. On the way home from Philadelphia tonight, after a midnight show of The Human Centipede (see: horror movies, above), I dealt with the usual impediments in Center City: girls wearing skirts too short to sprint across the crosswalk; guys pulling up their shirts to flag down cabs, their hairless bellies sliding prematurely into the flaccid rotundity of middle age. They would have had better luck suctioning ‘Baby on Board’ signs onto their stomachs. On I-95, just past Exit 4 towards Chester, a factory burned off waste gases through a smokestack. The evening was hazy with fresh rain; the lights overhanging the highway were smeared with mist. But the fire lit the clouds behind it orange, a clear flame bright enough to make the horizon glow neon. It was trying to burn a hole right through the night, to reveal daylight on the other side. I wanted to rush home, grab my camera, and rush back, park on the shoulder, and stand on the roof of my car and take pictures. But I realized: that’s ridiculous. A waste of time. Better to leave it as a fleeting image — one impossible to capture. Merely another moment stolen out from under you — that second you take to ease your foot off the gas pedal and turn your head to watch the sky flicker with fire. Problematic Jews: Shylock; Bernie Madoff; Charles Krauthammer; Matt Drudge; Henry Kissinger; Ayn Rand; Rabbi Yehuda Levin; Dracula; Ariel Sharon; Bill Kristol; Watto from Star Wars, Episode I: The Phantom Menace; Richard Perle; Michael Savage; Barabas; Kyle Broslofski; the woman at the deli who makes you pay for her fat thumb every time she weighs out a pound of brisket; Caspar Weinberger; Berine Goldberg; Nathan Leopold and Richard Loeb; Norman Podhoretz; militant West Bank settlers; David Horowitz; Geraldo Rivera; Ahasver; the international cabal of bankers and entertainment executives planning the takeover of the world financial system; Douglas Feith; that scruffy haired Jesus of Nazarene fellow. I’m of two minds on how to engage with literature and films with racist depictions. On the one hand, you can’t ignore the real damage that these stereotypes have done. The Shylock and Fagin-type figures, in particular, have been used to perpetrate systemic discrimination — and worse, obviously — against Jews. (Yes, some Jews do have those sharp hawk noses, but that just means that you have to tilt your head more to kiss them properly.) On the other hand, you want to forgive one element in otherwise engaging and important works. I adore Breakfast at Tiffany’s, for instance, despite the feeling that Mickey Rooney is going to hell for his portrayal of Mr. Yunioshi. 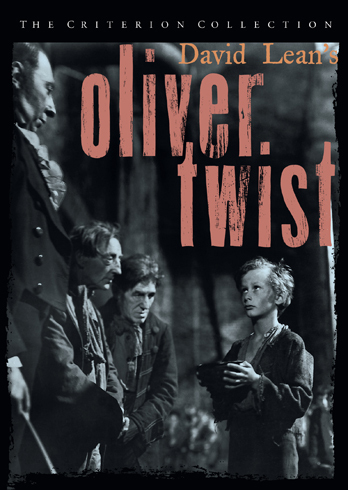 So, as my huge asterisk in talking about Oliver Twist, I duly note that Dickens, in later revisions of the novel, removed references to Fagin as “the Jew.” He also later took pains to include positive portrayals of Jews in Our Mutual Friends. I haven’t seen the Roman Polanski’s recent version of Oliver Twist, I understand that Ben Kingsley did his best to make a full character out of Fagin. Also, I have never seen any iterations of Oliver! — but this is less my avoidance of Fagin-related materials and more that I don’t really like musicals. Hey, we all have to resist our stereotypes and caricatures somehow. *if you don’t mind all the dancing Nazis. **especially if you blot out the anti-Semitic elements. ***written by a chick in drag! Denver doesn’t offer anything as particularly spectacular as the Australian outback for rites-of-passage, but that’s for the better, since I probably wouldn’t have survived, despite the best intentions of Aboriginal passers-by. 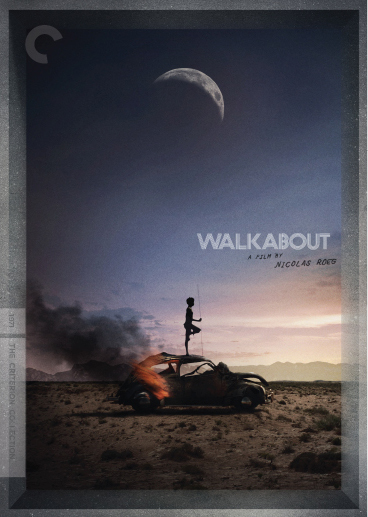 But it does have some lovely brick walls, and judging from the opening and closing shots of Walkabout, I think Nicholas Roeg would appreciate them. To each his own journey of self-discovery, though. Mine was the discovering of the 15L, the bus that ran down Colfax, the nominal heart of Denver. At my end of Colfax, the tail section of a long, straight snake, was innumerable motels, including the infamous Mon Chalet, which is a well-known “adult lifestyle” motel. Yes, where swingers go to meet. I didn’t realize this when I was 13, but I did like the Swiss chalet-style bungalows, with whitewashed walls and dark wood beams. The 15L (L for limited) took me downtown, where my mother worked at the Federal Reserve Bank. But I was less interested in the actual downtown (up to and including tourist-grabbing landmarks such as the 16th Street Mall and the glass mall of the Tabor Center) than the nearby environs of Capitol Hill. There, just a stone’s throw from the gold-leaf dome of the Capitol itself was my two early haunts: Capitol Hill Books and Colorado Comics — only the former of which still exist. On sunny days, I had lunch with my mother in the cafeteria of the Federal Reserve Bank, where she introduced me to her co-workers. I never knew exactly what her job was — but she was able to collect stamps from around the world for my quickly-adopted and just-as-quickly-abandoned stab at philately. I gave it up because I realized I would never be able to collect all the stamps in the world — there were just too many of them (unlike, for example, a discrete and handily-numbered series of DVDs). Plus, steaming and drying stamps seemed awfully onerous. No, comics were much easier. So I hung out at Colorado Comics, which was run by a curmudgeonly middle-aged guy, who would be played by Danny DeVito in my biopic. 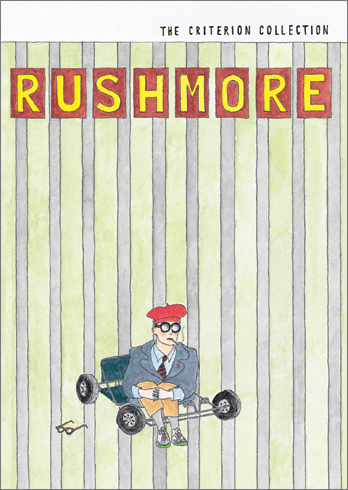 He had poorly-spaced teeth and wispy black hair which circled around his bald spot. 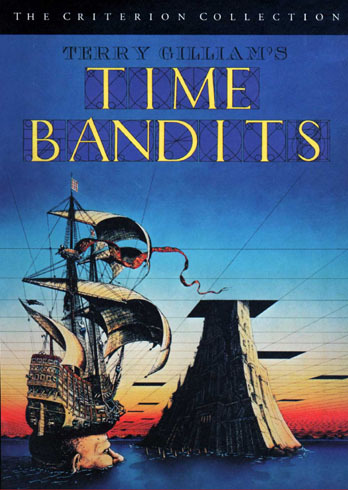 I must have spent hundreds of dollars there over the years, and yet when I became enthralled by the deluxe collected editions of Tales from the Crypt, he yelled, “If you want to read, go to a library.” There’s a scene near the end of Walkabout, where the girl and boy, having finally “re-discovered” civilization, come across a gentleman who waves them dismissively, the way civilized gentlemen do. He doesn’t stop to hear their entreaties or care about their story; there are rules, dammit, and they’re to be followed. The guy at Colorado Comics was sort of like that, except crabbier. I should have bought those Tales from the Crypt books. They resell for a fortune now. 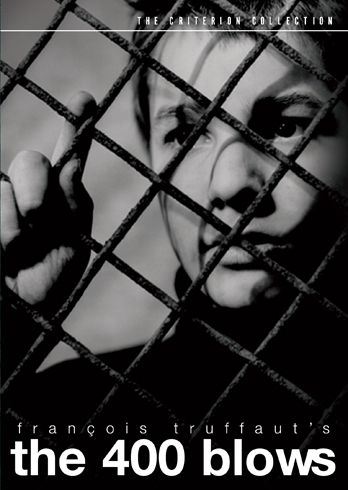 My own juvenile delinquency was tame, compared to Antoine Doinel’s in The 400 Blows. I had the benefit of loving, if perhaps at times smothering, parents, so my naughtiness and rebellion never came to a head. Conjugating verbs wouldn’t have seemed that bad of a punishment; I did quite well in English. But maybe conjugating them in French, in three different moods, would have made the task more unbearable. Our hobbies revolved mainly around X-Men comic books and getting in trouble. During the summer, we walked from our house to the Kmart about a mile away. And there, we’d shoplift. Mostly Legos (me) or G.I. Joes (him). I took Lego sets into the dressing room, and under the guise of trying on an ugly t-shirt, I stuffed the component bags of bricks into my pants, while Danny stood outside. He and I chatted loudly, asking how the shirt fit, to cover the sound of the crinkling cellophane. It itched my thighs as I walked. Danny, on the other hand, liked to duck behind the beach towel displays, a terrycloth curtain, and, there, extracted action figures, yearning to breathe free. We nearly got busted once. Danny had already gotten his stash. He’d hidden them in the handpouch on the front of his sweatshirt. And as we roamed the toy aisle, Danny said, “That woman is following us.” I didn’t know which woman he was walking about, and he pointed her out: middle-aged, curly henna hair, chubby. “No,” I said. “Are you sure?” We waited in an aisle and saw her pass by. She looked directly at us as she walked, true, did it mean anything? Returning the G.I. Joes would have been foolish; look what it did, after all, to poor Antoine. “No,” I said, because I didn’t. “No,” said Danny, because technically, he didn’t either. We turned our shorts pockets inside-out, and Miss Undercover Security looked disappointed but let us continue on our way. That close call marked the end of us aiding and abetting each other’s shoplifting, even if the shoplifting itself didn’t abate. Not on my part, at least. 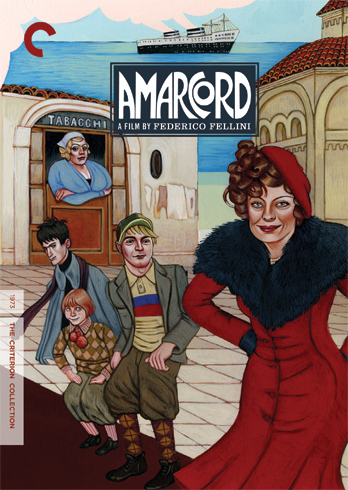 I admit: this is the second time I’ve seen Amarcord, and it’s also the second time I’ve had to stop the movie in the middle for some sleep before picking it back up from the beginning the next day. And while I could give several reasons why I needed a break, including having just taught a long day of classes, or the boyfriend coming down with the aches and pains of stomach flu, or the cold, windy weather that would bring down four inches of snow over the night, I’ve found that it’s usually much easier to blame the artist. So, I blame Fellini for my inability to stay awake. I blame Federico for the fractured narrative and picturesque vignettes that make it easy to hit the stop button, yawn, and go downstairs for a shower. I place the blame squarely on his shoulders for the continual breaking of the fourth wall, Brechtian-style and for Nino Roti’s infectiously jazzy score. I blame him for sending lyrical puffballs in the air; for community bonfires that celebrate the Bakhtinian carnivalesque; for lawyers and other intellectuals interrupted with fart noises; for schoolboy crushes and urine-soaked pranks; for lusty, callipygian women and even lustier, but less booty-licious men; for crazed family dinner; for priests fussing with flowers; for automotive circle jerks; for ridiculously trumped-up and smoky Fascist parades; for a Mussolini composed entirely of flowers; for a Grand Illusion-like shoot-out (of a poor gramophone playing the “L’Internationale” instead of an fife-tooting, escaping prisoner); for castor oil toasts that signal the dark side of flatulence; for the Grand Hotel with its vampiric princes, midget emirs and Bollywood fantasy harems; for dwarf nuns from insane asylums; for Fascist steamships; for white bulls appearing out of fairy tale-thick fogs; for Grand Prix racers who lose their ears; for peacocks pluming their tailfeathers in the middle of winter; for funeral processions draped in black; for the irony of rain on your wedding day; and, once again, for those damn puffballs. The stomach flu, on the other hand, I blame on students who don’t wash their hands before handing in papers.